I don’t like getting advice from skinny people. I feel like if you’ve never felt your thigh jiggle or your arm flap in the wind, you really can’t tell me how to lose weight. So it’s good to know the founder of Weight Watchers had a problem with Mallomars. But it’s even more comforting to know that she dropped more than 60 pounds and has kept it off, even into her 80s. 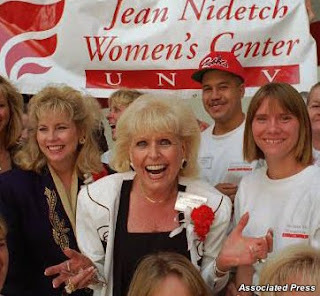 Jean Nidetch struggled with her weight even as a child, according to USA Today. By the age of 27, Nidetch weighed 214 pounds and was hiding Mallomars in the hamper so her family wouldn’t see her eating them. She turned to a diet program run by the New York City Board of Health Manhattan, and lost 20 pounds in ten weeks. That’s when she began holding her own weight loss meetings in her apartment with overweight friends. You can read all about her weight loss journey in her new autobiography The Jean Nidetch Story. "If you want to lose weight, you will — you can," she says. "You are capable. I'm 86, and I have blonde hair. That's not nature. It takes a desire ... and sometimes it's rather uncomfortable to get it done. It costs time and money. If you really want to do it, and you know it's your desire and you're capable of it, you will. It's that simple." This entry was posted by kate, on Thursday, April 8, 2010. You can leave your response .